Simple start:A plays to B and follows pass:B takes openly on back foot and plays to C and follows pass;C takes one touch out of feet then shoots then goes to A and so on.After a while change A to other side and passing goes A to C to B and players then shoot both sides. 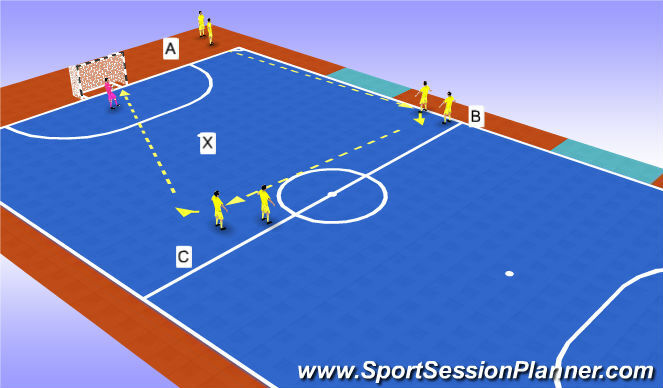 Static defender introduced at point X and C has to move ball to side past defender then shoot. C rceives ball and then plays ball to the static defender then moves and receives return pass to shoot.players movement dictates which side pass back goes. Development 4: C plays to static defender and receives straight ball back.Now has to take defender on 1v1. Number of possible developments is endless.